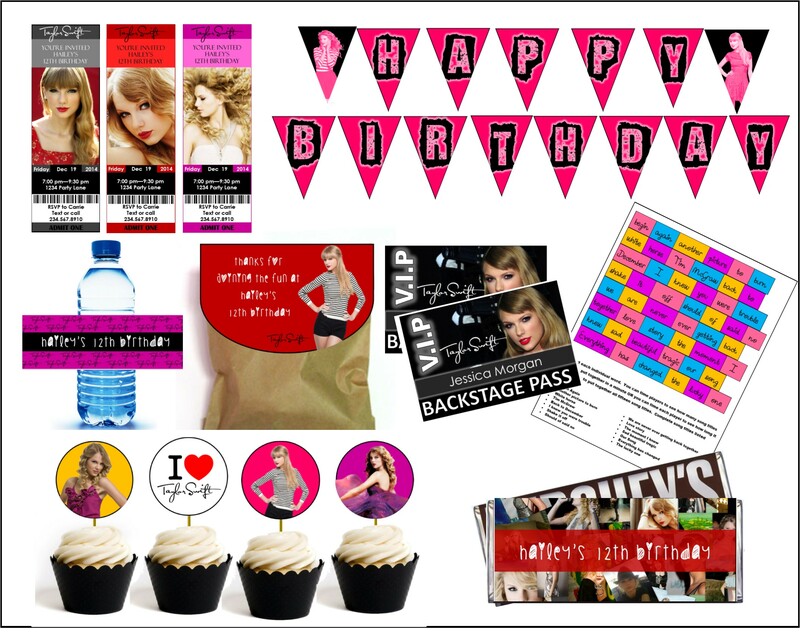 REMEMBER to check out our Taylor Swift Party Printables!! Let's party! Very T-Swift style! Few people can say that they don't like at least one Taylor Swift song. Besides her music being the type that can get stuck in your head for days, she also refrains from the testy lyrics of many popular female singers. Because of this, her rise to fame is supported both by children of all ages but also by the parents as well. 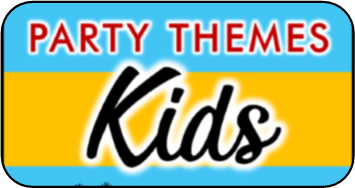 In acknowledging her many talents, we realize that she would also be a great party Theme. 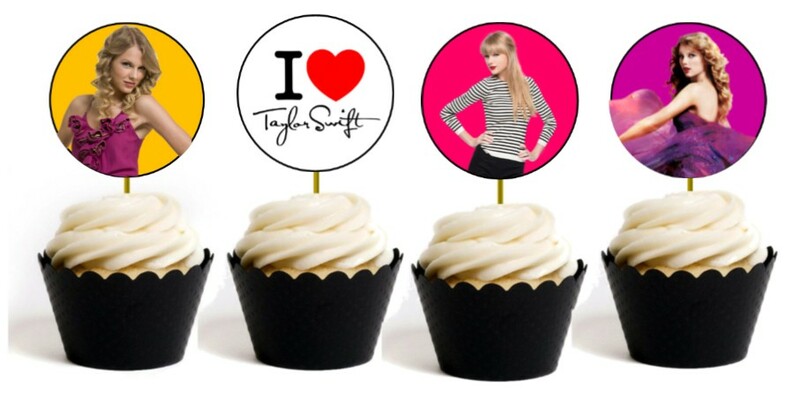 That's right we have created a Taylor Swift theme party just for you. 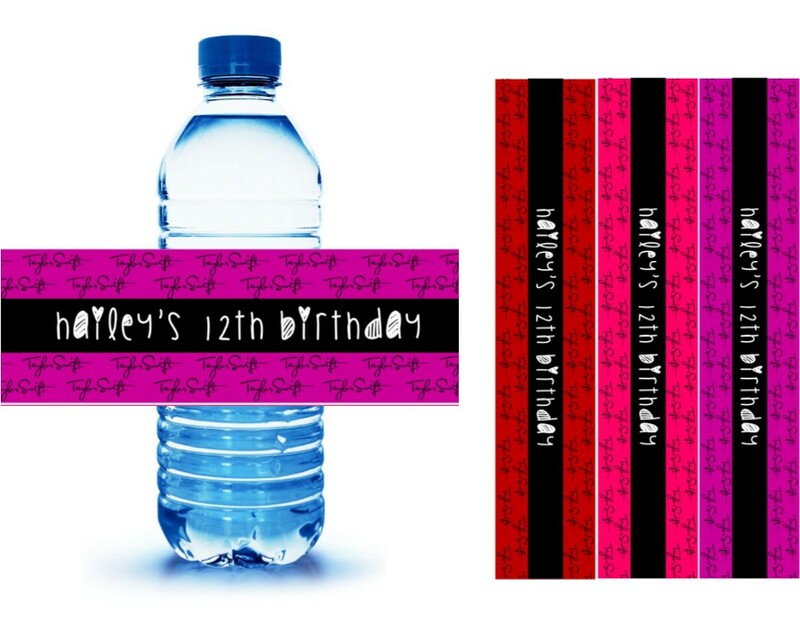 Along with games we have some awesomely designed printables to help create the atmosphere your little fan girl/boy will fall in love with. 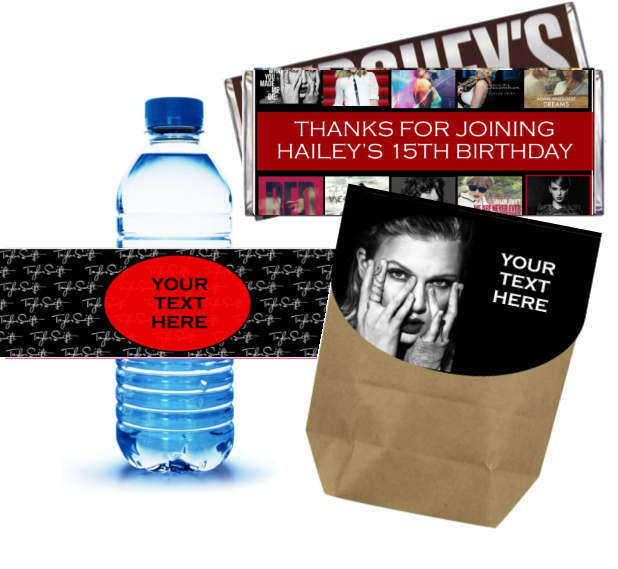 So check out this original Taylor Swift theme and get with the planning of an unforgettable event!! 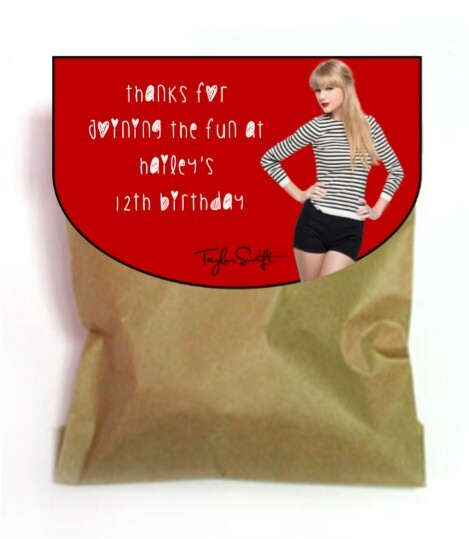 Below our list of party games check out our printable Taylor Swift Party Supplies! Players are presented with a pile of words all from Taylor swift songs. Players must put together as many song titles as they can within 1 minute. Our Taylor Swift song scramble game features fifteen swift song titles. 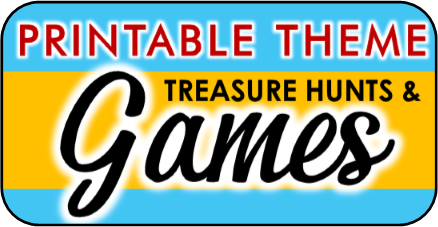 Cut out each of the words and you have everything you need to play the game. 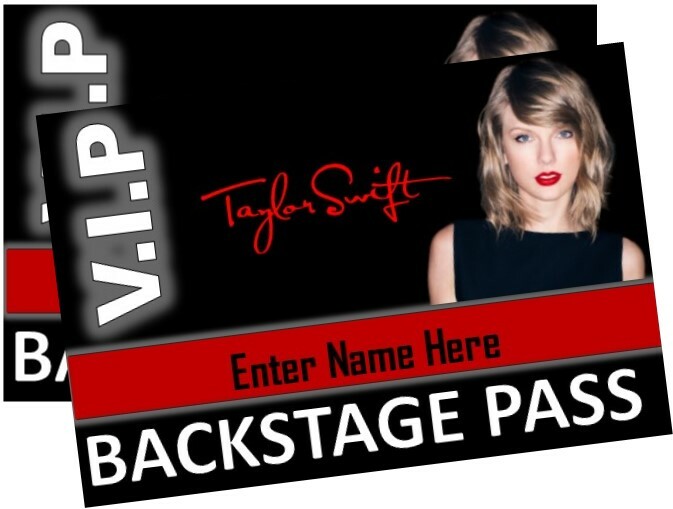 This printable game is included in our Taylor Swift printables! In this game players work together to write a new song. All the need is paper and pencil to play. First player writes the first line of a song then passes the paper to the next player who writes the next line, and so on until a song has been born. To make it even more interesting players can perform songs when they are finished. Another option is to have everyone draw a topic out of a hat and write and perform their own song. Players can then vote on the best song. 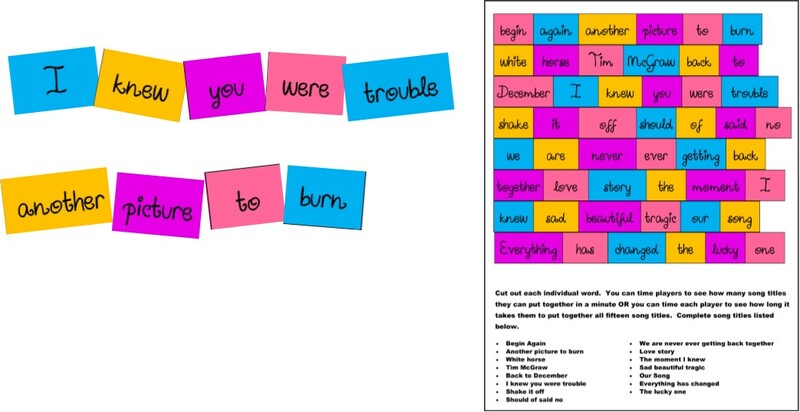 Also included in our Taylor Swift printables is our swifty time song parody game. 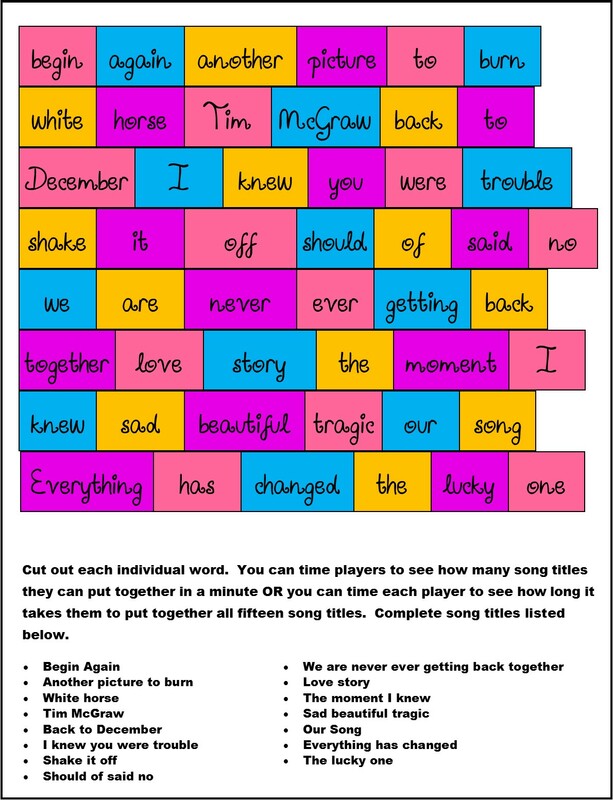 The song is the famous "Love Story" and the printable sheet includes all the lyrics from the song with certain nouns, verbs, and adjectives removed that are then filled in with new words by the players to create hilarious new versions of the song. You can have individuals each create their own song or you can create teams and have a song-off afterward to see whose song gets the most laughs. If you have the songs on karaoke even better, then you can have the players sing their new songs to the music. Have everyone lather on the red lipstick and make a kiss mark on an index card and mark their initials on the back. Collect all the cards and lay them out flat on the table, kiss mark up. Have players try and guess whose lips goes with each kiss mark. Players with the most correct guesses wins. When guests first arrive at the party pin an index card to their back with one of Taylor’s song title. Have players ask other players yes or no questions to try and guess which song is theirs. Can players pick out Taylor’s nose, eyes, mouth, ears, hands from a line up mixed with other celebrity features? Cut different celebrity features out of magazines, including those of Taylor’s. Spread them out and see who can identify the celebrity parts correctly. Can you get others to guess Taylor’s songs or lines from her songs by drawing pictures alone? For this game you will need paper and pen or a dry erase board and marker. You will also need to create slips of paper with Swift songs on them that players can draw out of a bowl. Divide players into two teams. One person from each team takes turns drawing. They have two minutes to get their team to guess the song the picked by drawing alone – no talking, acting or writing words. If their team doesn’t guess correctly after two minutes then the other team has one guess to try and steal their point. After every team has had eight chances to draw (or however many you decide) the team that has the most points wins. Players bop balloons in the air while the music is playing. When the music stop who ever is caught holding the wrong balloon must pop it and sing the lyrics found on the slip of paper inside, filling in the missing words. If they sing it correctly they get to stay in the game. If they mess it up they do in trouble trouble trouble – meaning they are out! Players continue to play until all the balloons are gone. Write T-Swift song lyrics with missing words on slips of paper and put one each into balloons before you inflate them. Number the balloons with a magic marker. Now have players bop around the balloons while the music is playing. If a balloon touches the floor, stop the music. The person who let it touch the floor must pop it and sing the lyrics inside correctly, filling in the missing words or they are out. 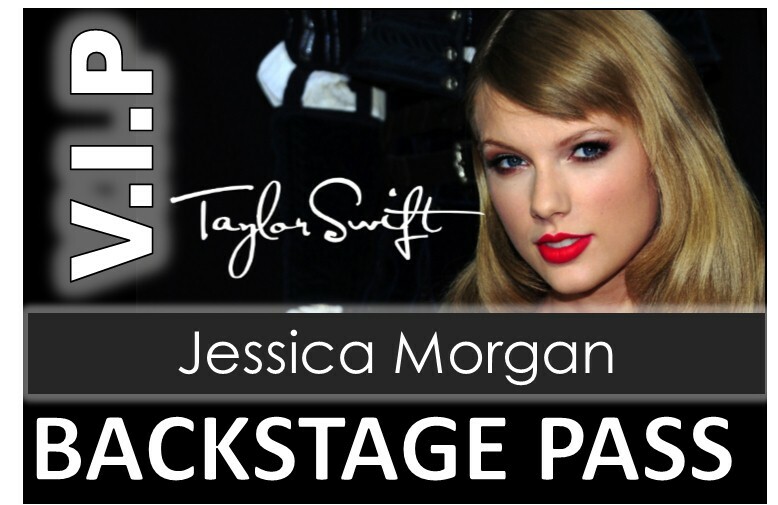 Have guests come dressed as their favorite Taylor Swift song or one of the characters she played in her videos. They will need to get creative. Perhaps they dress up like a cowboy and come as Tim McGraw, or dress up as winter wonderland and come as Back to December. Maybe they come dressed in their cheerleader garb like she wore in the shake it up video. It will be fun to see all the different costumes this inspires. Give a prize for most creative and original. 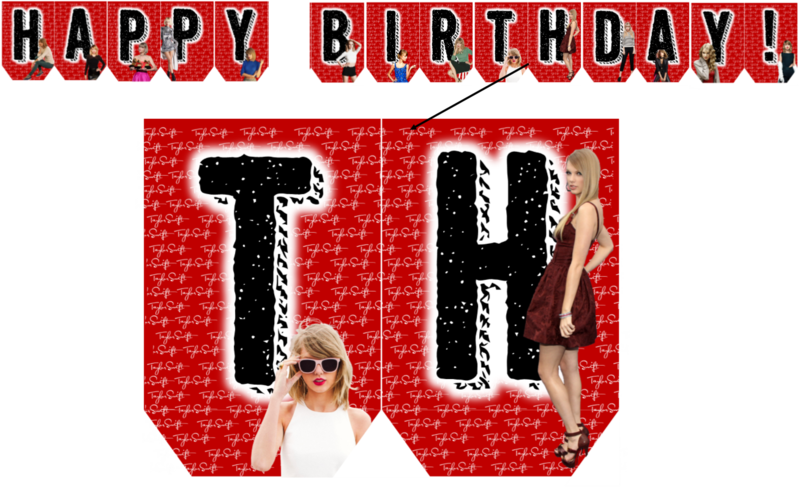 get your taylor swift party printables now!